Nationwide, there are too few farmers to populate market stalls and too few customers filling their canvas bags with fresh produce at each market. When the Nipomo Certified Farmers' Market started in 2005, shoppers were eager to purchase fresh fruits and vegetables, as well as pastured meats and eggs, directly from farmers in central California. But the market was small — an average of 16 vendors set up tables every Sunday — making it harder for farmers to sell enough produce to make attending worthwhile. "The market in Santa Maria is 7 miles in one direction [from Nipomo], and the market in Arroyo Grande is 7 miles in the other direction. Both are bigger markets, so shoppers often went to those markets instead," explains market manager and farmer Glenn Johnson. The decision to host the market on Sundays also proved detrimental. Many of the farmers participated in six or more additional markets each week and wanted Sundays to rest, says Johnson. In 2018, with attendance down and just five vendors signed on to sell produce, organizers of the Nipomo Certified Farmers' Market decided to shut down the event at the end of last season. Nationwide, the number of farmers markets increased from 2,000 in 1994 to more than 8,600 in 2019, which led to a major problem: There are too few farmers to populate the market stalls and too few customers filling their canvas bags with fresh produce at each market. Reports of farmers markets closing have affected communities from Norco, Calif., to Reno, Nev., to Allouez, Wis.
Markets in big cities are hurting too. 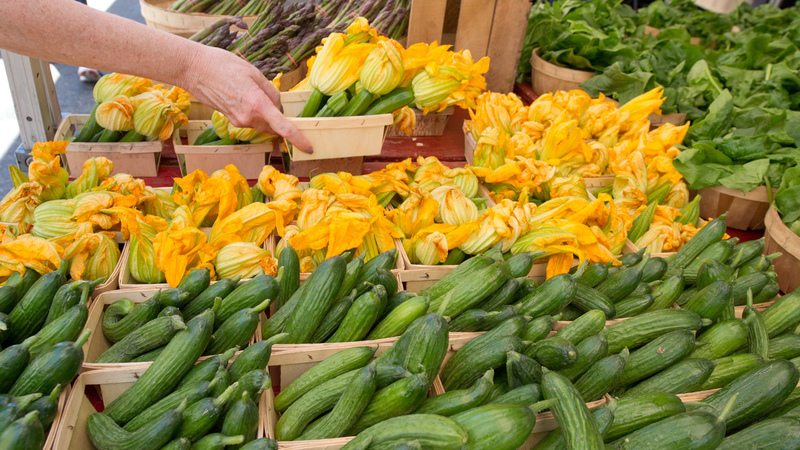 The Copley Square Farmers Market in Boston reported a 50 percent drop in attendance in 2017. In Oregon, where 62 new markets opened but 32 closed, the researchers of one multiyear study concluded, "The increasing popularity of the markets is in direct contrast with their surprisingly high failure rate." Diane Eggert, executive director of the Farmers Market Federation of NY, received numerous reports of closings; she believes the problem is one of pure mathematics. "There are way too many markets," she says. "The markets have started cannibalizing both customers and farmers from other markets to keep going." Eggert also points to myriad other options that consumers have for accessing fresh foods, including community-supported agriculture and home delivery options from companies such as Amazon, Instacart or Blue Apron that might be more convenient than shopping at a Saturday morning market. The farmers market in downtown Manteno, Ill., couldn't compete with larger markets, according to Sarah Marion, president and CEO of the Manteno Chamber of Commerce. Organizers kept the market going for more than a decade. In 2014, when the number of farmers and customers began to decline, the Chamber of Commerce changed the market's location and switched from Thursday to Tuesday evenings in hopes of reviving the market. Its efforts failed, and Manteno hosted its last market in the summer of 2018. "At the end, we had two farm vendors, and the customers would tell us, 'There are only two farm vendors, so we stopped coming,' " Marion recalls. Like other market managers, Marion cites fierce competition among local farmers markets. Just 10 miles south of Manteno, the Kankakee Farmers' Market is still going strong. Peggy Mayer, executive director of the Kankakee Development Corporation, believes the success is due in part to the longevity of the market. "Some farmers aren't willing to take a chance on a new market," Mayer says. "Our market has been around for 25 years; we have a track record in the community. This is a market where [farmers] know they're going to sell out." The market, which is held on Saturday mornings from May through October, attracts up to 50 vendors each week. Many of the farmers have tried participating in other markets, but most aren't producing enough food to serve multiple locations, according to Mayer. Marion believes that customers are drawn to bigger markets for more variety and one-stop shopping (and farmers benefit from selling all of their harvest through one large market). Still, smaller markets continue popping up, often in close proximity to other smaller markets. Eggert says that communities, often hyperfocused on improving access to fresh, locally grown foods and caught up in the excitement of a new neighborhood amenity, fail to think through the logistics: There are too few farmers and too few customers to make multiple markets viable. Rather than packing up their tents, smaller struggling markets could combine forces with each other to create a single, stronger farmers market. Before setting up farmers markets in every available park, public square and church parking lot, Eggert encourages would-be organizers to consider if the demand for fresh foods is being met through existing markets and whether it makes sense to partner with a neighboring community to establish a market. "Farmers markets are a key source of local food, but we'd like to see communities working together," says Eggert. "If five communities partnered on one market instead of starting five different markets, that one market would be a more exciting venue for customers and a more profitable market for farmers. We don't need more markets — we need stronger and more viable markets."